The trade shows of the old days were the same everywhere. You walked into a sea of black skirted tables. Some had signs hanging from them or behind them. People in suits handed you a brochure. But those days are gone. 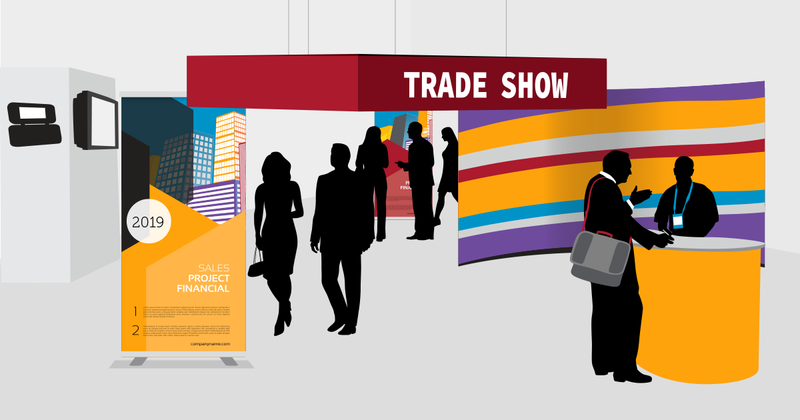 Trade show signage has evolved in the most fantastic way. If the idea of a trade show is to engage a prospect, the space in which you do that should be engaging. Many of today’s better booths are full on art exhibits. They are interactive playgrounds, multimedia showcases and even coffee shops. Event, an online blog for Event Management, highlights some of the best ideas for 2019. Any combination of the above can become an elaborate and functional work of art. Like all good art, it draws people to it. And when you’re in the business of selling, that’s exactly what you want – people drawn in. If you’ve ever been on the trade show circuit, you know the drill. You pop your materials out of the storage closet, dust off their carrying cases. You might check some as baggage or ship them all. When you arrive, you jump through another set of hoops to find them and transport them. But today’s display options are so much better to transport. Retractable banners are a wonderful option for the smaller trade show displayer. They are light, colorful, sleek, easy to set up and priced at a great value. Customize them with multiple messages. Let your creativity shine. HS Sign Shop has done countless of these from smaller retractable banners to event banners and electronic displays. Even if you have a limited budget, don’t limit your imagination when it comes to a trade show or event. If the idea of a trade show is to engage a prospect, the space in which you do that should be engaging. Many of today’s better booths are full on art exhibits. They are interactive playgrounds, multimedia showcases and even coffee shops. 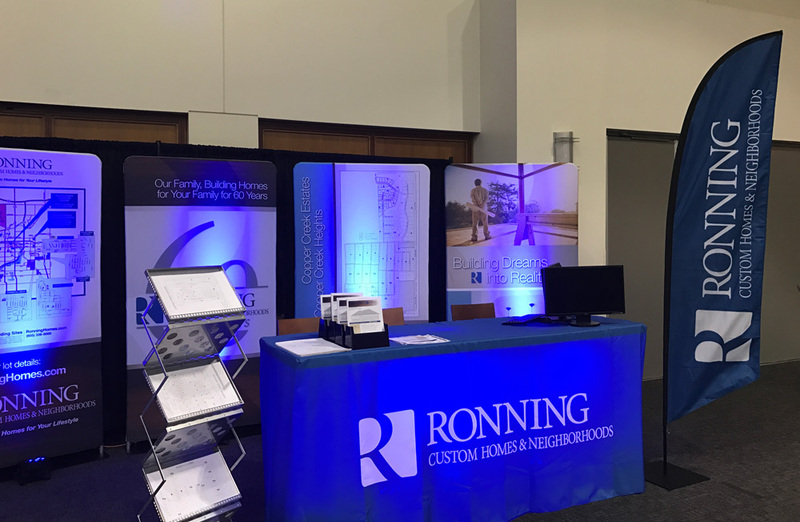 Looking to make your trade show more of a show? Contact the HS Sign Shop. In business these days it’s important to take advantage of every edge possible. When we think about labels, decals and signage, we often think of the identifying and promotional aspects of them – they can be a great marketing tool to provide basic information about your brand, and getting your name out in the marketplace. We love to come up with creative ways to cover the basics – such as the name of your company, your logo and your location. Our design team is able to come up with a completely new look for your business, if that’s what you need. But you may not have ever considered how labels, decals and signage can be utilized to improve efficiency amongst your in-house teams. We can develop some innovative ways to increase efficiency, and even inspire your employees! One way you may be able to maximize workflow and direct traffic in your office or production facility is by utilizing floor graphics. Strategic placement of floor decals helps acclimate new employees to your facility, as well as helping guests navigate your space with ease. This is especially relevant for larger factories and facilities. 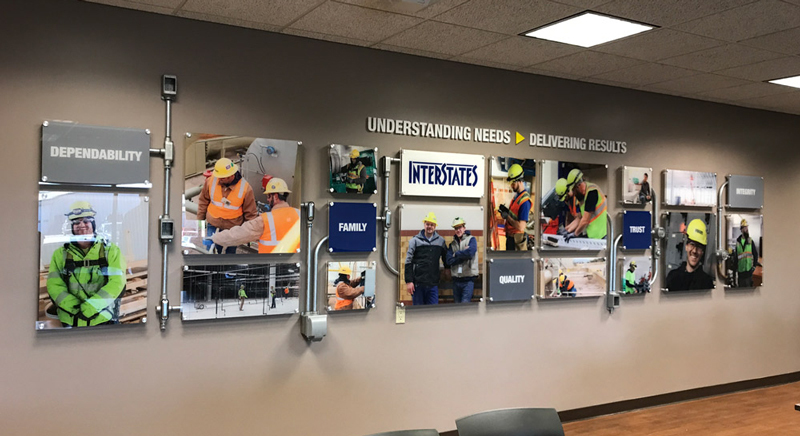 Large, eye-catching wall graphics can be used to inform your employees of best practices, important new policies, general company information, philosophical musings and inspirational quotes. A work environment that provides a supportive décor enhances engagement and productivity amongst the employees. Whether you want to label your machinery to take that extra step in the name of safety, or if you want to take your workflow or organizational chart and turn them into a unique art piece that helps keep your team on task, the HS Sign Shop can design and create unique labels, decals and signage that will help your employees be their best. If your industry deals in dangerous equipment or hazardous chemicals, you may want to consider going above and beyond the minimum regulatory requirements to maximize your team’s safety. We can enhance and enlarge any required safety labels or we can customize an informative and entertaining way to hammer home the importance of staying safe on the jobsite. We can create labels and decals that communicate this extremely important information in a memorable manner – for both your team and any subcontractors or visitors you may have on-site. Have you considered labeling your equipment in a way that reminds users about safety and performance issues? It may be time to consider going beyond minimum compliance, especially if your business operates under the auspices of the Occupational Safety and Health Administration (OSHA). If you do work on a dangerous jobsite, you may want to consider signage that speaks to how long its been since the last accident on the job. This works both as a safety message and a motivational message to make sure everyone is working hard, safely, to extend that streak! If your business specializes in packaging and shipping operations, you may want to consider assigning colors and designs on delivery trucks, equipment, boxes, walls or floors to help streamline your delivery process. We can print labels and decals that will not only help your sales, but decrease the time it takes for the product to get through the delivery process. If you’re looking for a way to be able to change your message, pricing or promotional information without a long lead time, temporary signage can be an excellent option to keep your employees in the know and on the same page in a fast moving environment. It’s also a great way to keep your team up to speed and tailor information in an industry where variable data and content are the norm. The HS Sign Shop is here for any of your label, decal or signage needs. If you don’t have a design you like, our team will create a new one you’ll love. If you already have the design, that’s no problem – we can produce the work and install it for you. Contact us for more ideas on promoting your business and increasing the efficiency of your employees! If you’re opening a new business in the retail space, then your sign is one of the first and most important things prospective customers will see about you. You need to make sure your sign features an eye-catching design. 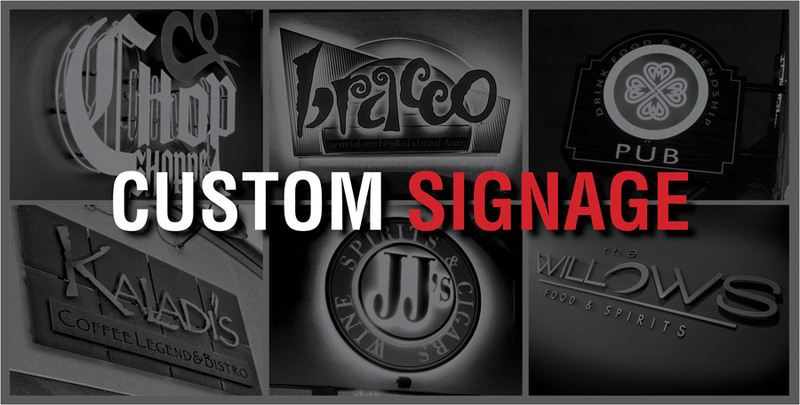 A bold custom sign will help you establish your brand and generate interest from the public. There are many factors to take into consideration when developing custom signage. We look at the available space you have for the sign, as well as what the area around your location looks like. You want to make a statement with your sign and make sure that it’s located in a place with maximum visibility. Your sign should set the appropriate tone for what your business offers when customers come inside – it should also be intriguing and pleasing to look at by passing foot traffic. To stand out from everyone else, you may want to consider a look that has unique textures and elements, such as metals or three-dimensional accent pieces that make your sign pop. Neon lights can be put to use to give your sign a distinctive glow. Backlighting behind multiple layers is a unique way to make your sign stand out. Your sign won’t get a second chance to make a first impression, so contact our team at the HS Sign Shop today for a custom sign that will get noticed. If you’re not sure what to do for a look, our graphic design team can create a sign that you’ll love. If you already have a concept, our team can execute your vision for you. Send us a message or call us at at (605) 331-2155.